Coral Reefs - Rainforests of the Sea? Coral Reefs Articles -> Coral Reefs - Rainforests of the Sea? Are coral reef communities analogous to tropical rainforests? Coral reef specialists discuss the implications of the comparison, and debate whether the analogy is accurate or if it is just a catchy “sound bite” meant to garner attention from a public more aware of rainforest degradation than threatened coral reefs. The discussion centered on the value of the analogy as an educational tool as well as its degree of scientific accuracy. The analogy also sparked an examination by some participants of the true similarities and differences of the two systems. The biodiversity of coral reef environments rivals that of tropical rainforests. Some educators and scientists use the comparison to garner more public awareness of reef issue. 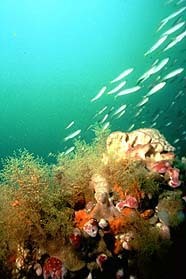 The outcroppings of Gray’s Reef, pictured here, are known for their live bottom habitat, which is abundantly populated with hard and soft corals, sponges and hydroids. A colorful, Madracis sp. coral "landscape" on the Flower Garden Banks. Participants discussed how the public generally perceives tropical rainforests as complex, diverse ecosystems that are threatened and worthy of conservation efforts, but a deeper understanding of the rainforest is not widespread. Public understanding of coral reefs tends to be even weaker. Therefore, most participants agreed that as an educational tool used on a fundamental level, the reef/rainforest analogy is relatively accurate and useful, and can raise public awareness about the importance of reefs. Comments from participants not directly involved in coral reef research, (i.e., a filmmaker, an aquarist and a manager of coastal and marine tourism), reiterated this point. The analogy successfully conveys the basic message that both systems are highly diverse, are suffering from human impacts, and are worthy of protection and conservation. In addition, some participants cited studies on analogical teaching techniques that support the notion that analogies are powerful tools in teaching complex scientific concepts, at least with learners of lower ability or minimal background on the subject. However, the analogy is accurate only on a basic, superficial level. It begins to break down when specific characteristics of the two ecosystems are compared. Countless fish species depend on coral reefs for their survival. This queen parrotfish (Scarus vetula) is feeding on coral. While it remains relatively still, a couple of juvenile bluehead wrasse (Thalassoma bifasciatum) can undertake some cleaning work on the fish. Participants discussed the extent to which the analogy could be applied by exploring the specific natures of the two systems. Most agreed that both reefs and tropical rainforests support a complex habitat structure, and are highly productive and diverse. However, participants suggested that when specifics of the two ecosystems are compared, the differences begin to outweigh the similarities. For instance, tropical rainforests are richer in species and have higher canopies; reefs have a greater gross productivity. Species diversity and interaction is different between the two ecosystems. Recruitment in tropical rainforests and coral reefs also is different. In a reef environment, broadcast spawning ensures widespread dispersal of coral larvae. In a rainforest environment, however, successful seed dispersal and germination is dependent on a number of sensitive circumstances. Reefs and tropical rainforests differ significantly in taxonomy as well. Another major difference, according to one participant, is that many tropical rainforest organisms feed on the major structure of the forest—trees. Few organisms in a coral reef habitat feed on the major structure of the reef—coral. Another participant suggests that the predation of trees in the tropical rainforest does parallel the predation of coral. Insects and other tropical rainforest organisms prey on trees, injuring but not killing them. Similarly, organisms such as gastropods, crustaceans and fish graze on coral but normally do not kill them. Predators in both systems continually exert pressure on the energy resources of their prey.